White Chocolate–Cranberry Cheesecakes! No-Bake Thanksgiving Dessert / Hey, EEP! Do you serve a signature family dessert at Thanksgiving? We have a few. One of my favorites: New York cheesecake with berry sauce! Only my Barefoot Contessa–loving godmother makes. It's funny how that happens, right? It's just an Ina Garten recipe (this one I believe). Technically any one of us could bake it but we've designated my godmother the cheesecake-maker of the family. I'm relieved, actually, that no one asks me to bring cheesecake to family gatherings. I love eating cheesecake but I really hate making it (mostly because mine always cracks—always!—and water baths make me nervous). 1. Put the cranberries and 1/2 cup sugar in a microwave-safe bowl; cover with vented plastic wrap. Microwave on High 4 minutes or until syrupy, stirring halfway through. Refrigerate, stirring occasionally, until cool. 2. Meanwhile, pulse the gingersnap cookies and butter in a food processor fitted with the blade attachment until finely ground. 3. Beat the cream cheese, white chocolate, heavy cream and remaining 1/4 cup sugar until smooth. 4. 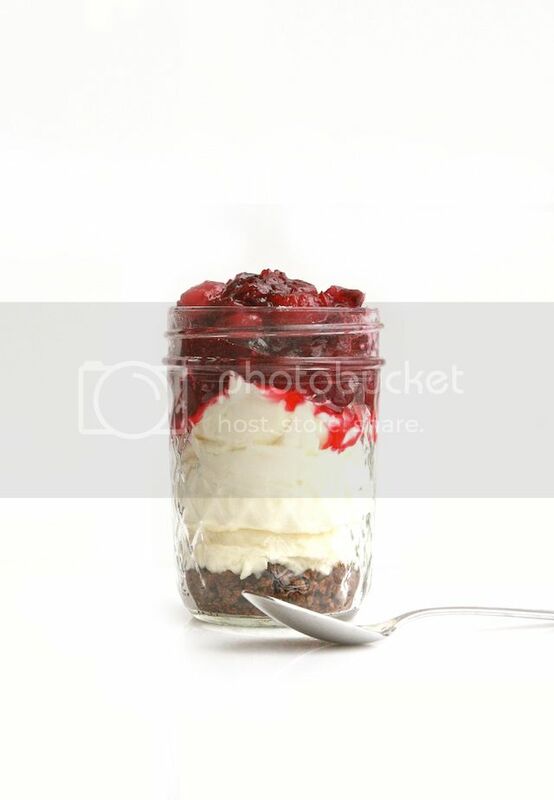 For each cheesecake parfait: Layer crumbs, cheesecake filling and cooled cranberries in a jar or dessert cup. Keep cool until ready to serve. For even more no-bake dessert ideas, check out my Chocolate Lover's Tiramisu, 5-Ingredient Frozen Pumpkin Pie, or Coconut Macaroon Cakelettes!